This study provides a fascinating, fresh analysis of the virtues of shareholder participation in the context of contemporary corporate governance. 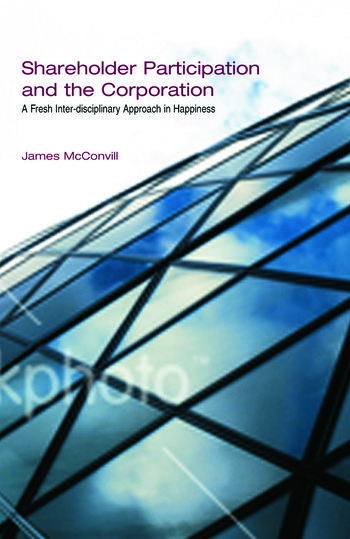 By applying recent empirical studies to human happiness, McConvill convincingly argues that shareholders, particularly individuals, should be included in the internal governance framework of public corporations and enjoy a direct participatory role in the corporation if they so choose. Recent studies have consistently shown that active participation is one of a limited number of factors that has a positive correlation with levels of personal happiness, however while disciplines within the social sciences have long considered the implications of these findings, legal scholars have failed to grasp their significance. Shareholder Participation and the Corporation addresses the dearth of literature currently available by exploring and evaluating the implications of empirical happiness studies in relation to corporate law and governance, focusing specifically on the role of the shareholder. It provides a compelling argument for those seeking to analyze shareholder participation in a different light. James McConvill is a Senior Lecturer at the La Trobe School of Law in Melbourne, Australia.